Friendship is made of teachable skills. Here are 25 ways to help kids make friends and keep the old! Everyone needs friends –– but especially kids. 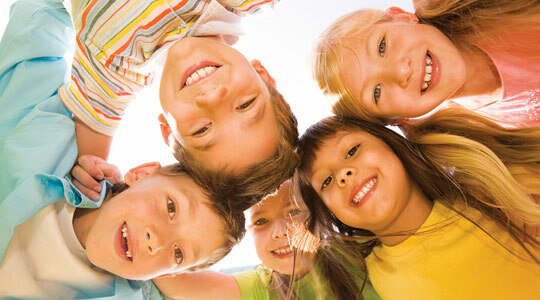 Of course, the prime reason a kid says friends are important is for fun and companionship. But the latest research tells us friendships are far more significant in our kids’ lives than we ever thought before.Kids need to know how to make friends. Friends influence our children not only in the here and now but also lay the groundwork for adult relationships, health and well-being, the careers they choose, their self-esteem, whom they choose as their life partner, and how they parent their own kids. Friends also impact the development of empathy – a child’s capacity to feel with another human being. The fact is, friends have a great deal to do with our kids’ happiness and well-being. And it’s through friendships that our kids will learn how to navigate through the rough waters of their social development and acquire all those traits of humanity that matter in leading good lives like empathy, compassion, courage, fairness, justice, peacemaking. Exposing children to differences and providing collaborative opportunities to learn about others can cultivate empathy and help them gain the Empathy Advantage. The good news is that we can help kids make friends. It involves skills which can be learned. Here are 25 ways to help a child make and keep friends. 2. Boost manners. When it comes to friends, manners do count, and are appreciated by other parents. 3. Encourage listening. Listening lets a friend know another is concerned about their needs. Tell your child: “Focus on what your friend is saying. Hear their words!” (See Emotional Literacy; Empathy Habit #1 in UnSelfie). 5. Use a friendly voice. A warm, welcoming voice tone goes a long way in boosting likeability. Help your child practicing using an upbeat, friendly tone so kids want to hear what he says. 6. Stress assertiveness. Encouraging kids to “look at the color of the talker’s eyes” helps them appear more confident and less shy, as well as interested in the speaker’s words. 7. Learn to converse. Stand or sit still, and focus on the speaker. Make a comment to show you care: “You’re kidding?” “Really?” “That’s great!” Show that you understand. 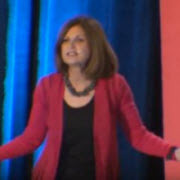 “Okay,” “Got it,” “Right,” “Thanks,” “I see.” Ask the person to explain if you don’t understand: “Do you mean…?” “What happened then?” “Did you want that to happen?” (See Emotional Literacy; Empathy Habit #1 in UnSelfie). 8. Make time for play. Carve time into your child’s schedule for play dates and social interactions to expand social competence. Friendship making takes practice. 11. Share friendship stories. Tell your child your own friendship stories – struggles, losses, and make-ups- to help her understand that friendships tiffs are normal. 12. 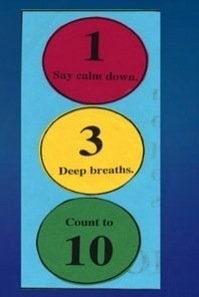 Show how to calm down. Kids need to learn not to talk to a friend-or anyone else-when really upset. You’re might say something you regret. So show ways to calm down first like walk away to take deep breaths, count to 10 or just say, “Let’s talk about this later.” (See Self-Regulation, Empathy Habit #5 in UnSelfie). 13. Teach traits of a good friend. The relationship is mutual (so that both kids have reasonably equal power), voluntary (both kids want to be part of the friendship) and positive (both members genuinely like each other, enjoy spending time together, and trust each other enough to share secrets and personal information). 14. Reinforce kindness. Popular kids care, share, and are helpful. Praise your child’s prosocial behaviors so she knows kindness matters. (See Practicing Kindness, Empathy Habit #6 in UnSelfie). 15. Talk emotions. Kids can’t care about others if they can’t recognize feelings. So, use emotions words and point out facial expressions, voice tone and body language. (See Emotional Literacy: Empathy Habit #1 in UnSelfie). 16. Use perspective taking. Asking: “How would you feel?” helps children grasp the needs and feelings of other people. Ask it often. (See Perspective-Taking, Empathy Habit #3 in UnSelfie). 17. Be a friend! If you want your child to be a good friend, make sure you display those behaviors yourself. Kids mimic what they see. 18. Encourage encouragement! Kids like to be around peers who build them up. Teach your child how to encourage others: “Great idea!” “Super!” “Nice try!” (See Collaboration; Empathy Habit #7 in UnSelfie). 19. Learn to resolve problems amicably. An important secret to getting along with friends is to learning how to solve a problem together. Teach STAND: Stop and calm down; Tell the other in a respectful town how you feel and listen to their side; Assess alternatives by brainstorming; Narrow the Choices; Decide on one and do it). (See Moral Courage, Empathy Habit #8 in UnSelfie). 20. 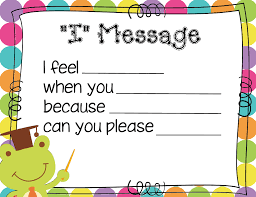 Use I Messages. When you talk say how you feel. Say why you feel that way. Say what you want or need to make things fair. Don’t say “You did this….” Or “you said that….” Your job is to attack the problem and not your friend. (See Emotional Literacy, Empathy Habit #1 in UnSelfie). 21. Learn strong body language. Peer pressure is part of the social jungle and kids must learn to speak out. The first step is to appear more confident: Stand tall, hold your head high, and put your shoulders slightly back so you look more confident and less afraid. (See Emotional Literacy; Empathy Habit #1 in UnSelfie). 22. Get your kid to see the other side. Kids often get so caught up in their own point of view that they lose sight of where their friend is coming from. “How does Patrick feel?” “Did you hear what he actually said?” What would he think is fair?” (See Perspective Taking; Empathy Habit #3 in UnSelfie). 23. Learn to say “no” using a firm voice. If you don’t feel comfortable doing what a peer suggests use a strong, firm voice and say a short, direct message: “No.” “Nope.” “Cut it out.” “No way” until he understands that no means no. 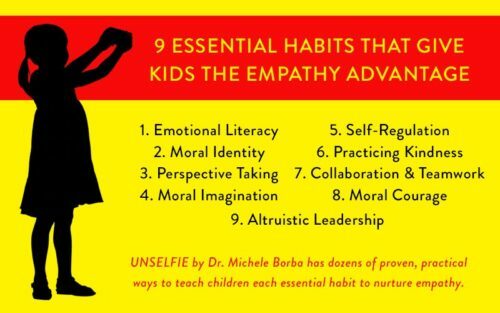 (See Moral Courage; Empathy Habit #8 in UnSelfie). 24. Practice Rock, Paper, Scissors to take turns, and make things fair. Each kid simultaneously thrusts out a hand forming rock (fist), paper (flat), or scissors (two fingers). Rock breaks scissors; paper covers rocks; scissors cut paper. Whoever doesn’t survive the rounds is the winner. (See Collaboration; Empathy Habit #7 in UnSelfie). 25. Enforce: “No take backs.” Emphasize to your child that once you agree on the rules of a game or agree to a trade with a friend, you may not “take back” (change the rules or take back the object) unless the other person agrees. Teach your child to make an agreement and commit to it by shaking on it. Then the deal is final. Friendship is comprised of skills like taking turns, having a conversation, joining a group, problem solving, and listening. Choose one skill friendship-making skill at a time, explain the value, show how to use it, practice togher until your child can use it alone, and then add the next and the next. You’ll be boosting your child’s social competence as well as his ability to feel with others. Empathy is what our children need in today’s plugged-in, trophy-driven, me-first world. I’ll share proven ways in this blog that we can use to cultivate our children’s empathy and switch their attitudes from WE, not ME. 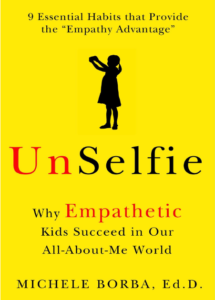 The ideas and story from this post are adapted from my latest book, UnSelfie: Why Empathetic Kids Succeed in Our All About Me World which describes how to cultivate the Nine Crucial Habits of Empathy, and offers dozens of proven ways parents and teachers can use from toddlers to teens to do so. THis blog is great. It will surely help my child make friends easily. 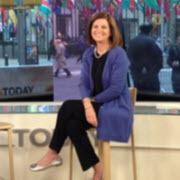 Michele, you have displayed your leadership in the field of education like no other. 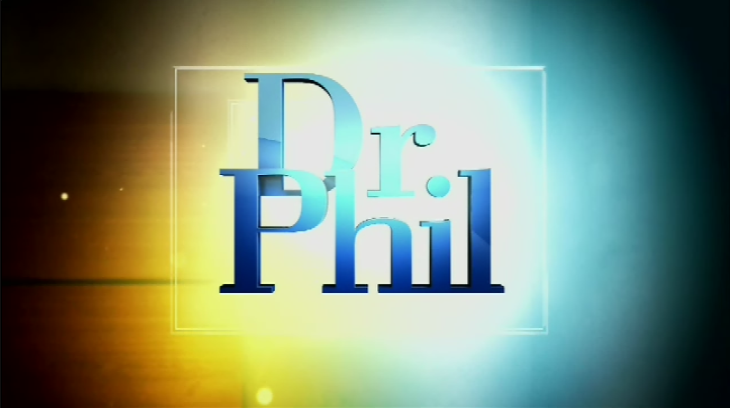 Your grounded approach and insistent on scientific review has displayed the clear success of your techniques. 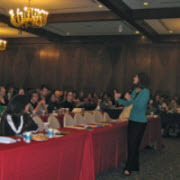 What a vivacious speaker—enthusiasm through and through!